Yep, it’s that time of the year again. The announcement of the 2012 winners of the Caldecott and Newbery Medal is mere days away. And, although these awards may not have as wide an appeal as film and television awards, the blogosphere, schools and libraries are all abuzz with excitement. Each year, thousands of kids get a kick out of choosing “Mock” Caldecott and Newbery Medal winners and comparing their favorites with those of the judges. 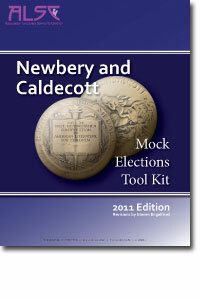 In fact, The American Library Association has created a tool kit to help teachers and librarians ramp up the excitement, Newbery and Caldecott Mock Elections Tool Kit. It’s a little pricy, but invaluable for schools and libraries. What fun. For those of you who’d like a little help narrowing down the contenders, you could hardly do better than Betsy Bird’s predictions over at A Fuse #8 Production. Personally, I can’t wait til Monday when the winners of these and some other sixteen awards will be announced because I just know that I’ll have a whole lot of great books to put into my ‘to read’ pile. Once again, my hat is off to Betsy Bird over at A Fuse #8 Production and here’s why. She has managed to put together a lovely list of possible contenders for both the 2012 Newbery and Caldecott Awards. So why is that such a big deal? She does it every year, right? Yes, but this year is different. This year, Ms. Bird became a new mom. Now, I don’t want to disparage motherhood. There is probably nothing in the world more important to me than my three lovely daughters. But, that first year of motherhood came closer than anything I’ve experienced before or since to turning my brain into mush. It’s important that you understand that I have been a big big reader since I was about 13…EXCEPT during my first year of motherhood. That year, my number one spare-time goal was sleep. I longed for it. I fantasized about it. I daydreamed about. And when I could, I stole away and gave myself up to it with utter and complete abandon. If I finished a book that year, I don’t remember it. I don’t remember a single solitary title. I know I read to my baby. I know I bought books. I know I checked out books for both myself and my daughter from the library. But I don’t remember what they were or if I or she enjoyed them. Of course, one adapts. It took me about a year, but I learned to manage with less sleep. I learned to grab a little shut-eye whenever my little girl (who detested day-time naps almost as much as she hated sleeping at night) dropped off. In time, I functioned so well that you’d barely know I was sleep-deprived (tips for new moms: micro naps are a must and concealer is your new best friend). Now I know that not all little ones were like my first. Some children actually do nap. Some go to bed at heavenly times in the evening. And some even sleep all night. Fortunately, my second and third daughters were sleepers. But as often as not, I hear from young moms that they are dead tired. You may have heard the term “mommy brain syndrome” which loosely translates into sleep-deprived moms (although I suppose that sleep-deprived dads can also have “mommy brain syndrome”). So, today when I checked in on A Fuse #8 Production, I was delighted, absolutely impressed and only mildly jealous, to see that Betsy Bird is still reading up a storm. Furthermore, she not only remembers books read months ago, she is actually able to comment intelligently on them. I can only marvel. For those of you who have children who are good sleepers, appreciate your good fortune. And for those of you who suffer from sleep-deprived “mommy brain,” let me assure you that it doesn’t last forever. My little darling grew into a book-loving 30 year old who has finally learned the joy of naps and early nights. I just wish she would have learned it a little sooner.